In the 1970s workers at the Lucas Aerospace Company in Britain set out to defeat the bosses plans to axe jobs. They produced their own alternative "Corporate Plan" for the company's future. In doing so they attacked some of the underlying priorities of capitalism. Their proposals were radical, arguing for an end to the wasteful production of military goods and for people’s needs to be put before the owners’ profits. Lucas Aerospace in the early 70s was one of Europe's largest designers and manufacturers of aircraft systems and equipment. It had over 18,000 workers on its payroll, spread over 15 factories, throughout Britain. 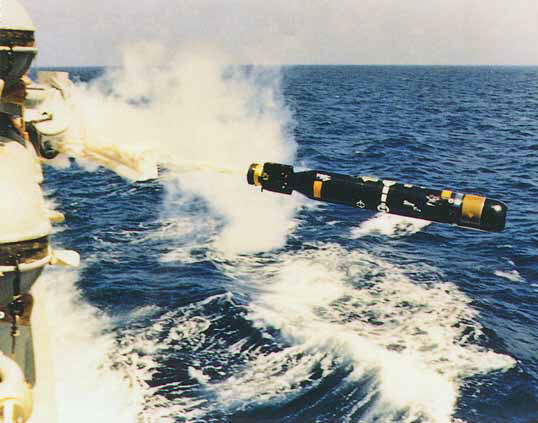 Nearly half of its business was related to military matters - in production of combat aircraft and the Sting Ray missile system for NATO (pictured, above). But it also had small interests in medical technologies. The company had been formed into the size it was through the take-overs and amalgamations of smaller size companies. It had been backed by the Government of the day who wanted a strong and efficient aerospace company to compete with the other European manufacturers. As part of achieving this Management planned to rationalise the whole 15-factory operation into a more integrated and streamlined company. This would mean lay-offs for at least 20% of the workforce and the closure of some areas. The prize for the owners of Lucas in doing this would be a much greater involvement in the military markets where profit rates were very high compared with other industries. The intentions of the company owners and management did not go unnoticed by the Lucas workers or their Shop Stewards Combine Committee (SSCC). The origins of the SSCC was in the strong trade union tradition at the time in Britain though particularly in the aerospace industry. Over a period of years the workers in the different unions had seen the need to co-ordinate their negotiations against a single management so as to avoid poor wage increases as one section was paid off at the expense of the others. So they formed shop stewards committees that bridged their different union memberships. As the company had grown bigger these shop steward committees from different areas also linked up to carry on the same idea of meeting the management with a single voice for all workers in any negotiations. The SSCC at Lucas which linked all the company sites had not, however, come about without much effort or struggle. It had grown to the importance it had because of its involvement with the direct rank and file struggles of workers there and was looked to by many far more than their individual unions or full time union officials. One of the most spectacular successes of the SSCC was in the Burnley strike in 1972 when by means of mobilising the support of all Lucas workers, a 13 week strike by Burnley workers was carried to a successful conclusion leading to a wage increase 167% larger than that nationally negotiated by the union officials! The SSCC in the course of the strike had organised widespread collections and support meetings for the striking workers and had backed this up with strategic work stoppages at different plants that had maximised the losses to the company with the minimum loss in pay. The support action co-ordinated by the SSCC was extremely effective and eventually saw management capitulating despite their previous claim that they wouldn't give the workers a penny extra. After the Burnley strike, the SSCC was able to achieve much better pay and conditions for all union workers at Lucas. Local disputes in the company were often settled through sympathy action co-ordinated by the SSCC. Management was unable to break the new-found unity and was fearful of any large strike, like that at Burnley, breaking out again. It was against this background that the SSCC in 1976 proposed the alternative Corporate Plan (below) to Lucas's management. It was the product of two years planning and debate among Lucas workers. Everyone from unionised engineers, to technicians to production workers and secretaries was involved in drawing it up. It was based on detailed information on the machinery and equipment that all Lucas sites had, as well as the type of skills that were in the company. Its central aim was to head off Lucas's planned job cuts by arguing that the concentration on military goods and markets was neither the best use of resources nor in itself desirable. It argued that if Lucas was to look away from military production it could expand into markets for "socially useful" goods where it already had some expertise and sales. If this was done no job losses would be needed. The Plan itself did considerable market research for what was needed to replace the military goods and what Lucas could actually make. According to it Lucas could eventually wind down its military production, keeping all its present workforce. In other words no job losses at all were envisaged. Moreover, the production of high technology equipment like kidney dialysis machines would be of far more benefit than Sting-Ray missiles to society. The workforce would be much more happy with this from the point of view of jobs and the quality of work. Lucas's owners and management did not however place a very high value on either the provision of work or its quality. When the Plan was presented to them they shunned it. They resented "their workers telling them what to do" and insisted on the Company's commitment to defence production. The job cuts and rationalisations were to continue. The full time union officials half-heartedly pledged their support for the Plan, but did nothing to widen the support among other trade unionists for it. This partly reflected their antagonism to the radical proposals of the Plan which went outside, by a long stretch, the cosy wage negotiations they were used to. But also they were antagonistic to the SSCC which they saw as getting above its station. They were worried that the influence of the SSCC and the hornets’ nest it was stirring about job cuts and "socially useful" production might spread beyond their control even more than it already had. Maintaining the status quo was particularly important to them also at this time because of the pact signed between the Union leaders and the Labour Party Government which was aimed at taming the demands of union members in return for more say for the Union bosses in "national policy". The Labour Party similarly, now forming the Government, applauded the Plan but spent their time avoiding it like the plague. It reflected some of the weak politics, however, of the SSCC that they had turned to them at all. It was the British Government (with active Labour Party involvement) which in the first instance had supported Lucas's move to a competitive military manufacturer for NATO. Like all "socialists" in Government they had promptly forgotten their commitment to help the workers’ movement. If it was direct industrial action that had built the SSCC into what it was and gave it the confidence to produce the likes of the alternative Corporate Plan, then it would have been the same industrial action that would have carried it forward further. That such direct action by the workers was not looked to by the SSCC in the aftermath of its rejection by the Lucas bosses reflected major weaknesses. Looking to the Labour Party was a huge weakness since it presupposed that Labour really had the interests of the workers at heart, which it didn't. The Labour Party in Government was looking after the interests of the British state. It was not going to challenge capitalism - or its values - which the Lucas Plan did at root. Workers, as became clear, only had themselves to look to for help. If the SSCC looked to this they may have got somewhere. To some this response of management's was not very surprising. But these people were in the minority. The bulk of the SSCC while expecting an argument and some tough negotiations were totally taken aback at the response. As one AUEW shop steward put it: "Quite honestly, I thought the Company would have welcomed it... that they would see it as constructive trade unionism... ". Constructive it may have been if the world was being run along different lines - ones that valued people’s need for meaningful work and put social needs above military production. The company's owners were adamant that this wasn't the way things were going to be. For them capitalism was the order of the day and this meant profits first and foremost. Moreover it was their right to "manage” Lucas and to decide where its resources would be used. To them the 18,000 people working at Lucas had no say in these fundamental matters. In the aftermath of the Lucas Plan they determined to break the SSCC and its influence, which as we will see they did. If the rejection of the Plan came as a surprise to the SSCC, the aftermath put them in a spot - what to do next. Previous to this when management had stalled or rejected their demands they had returned the matter to the rank and file workers where industrial action of some sort had been used to shift the company. But this time, this did not happen. Instead the SSCC turned their attention to winning the Labour Party and the full-time Union officials to their cause. In doing this, they spent less and less time in consultation with the workforce at Lucas. The workers there who would have had the most to fight for and to gain from the Plan became less informed. Even the regular news-sheet previously produced by SSCC became more and more irregular, eventually disappearing altogether, Slowly the unity built up in previous times was whittled away as SSCC members were now spending a huge degree of time meeting Labour MPs and Ministers - neglecting the real job of maintaining their workplace organisation. As the lobbying of Labour Party MPs and Union bosses continued, Lucas's management proceeded with the job cuts and rationalisations where they could. With the SSCC busy lobbying but not co-ordinating any action, unity weakened among the workforce. Different areas were left to fend for themselves. With this situation Management did have the upper hand and used it. Some local victories were won by workers and jobs saved. Mainly this was through industrial action of some sort to force implementation of parts of the Plan. But this situation was a poor replacement for the unity and strength of previous times. Inevitably when jobs went, activists and in particular some of the main workers behind the SSCC were victimised. Once again, as has too often happened in Britain, faith in the Labour Party was a slippery slope to being sold out and losing the fight, Lucas workers had got to where they had through their own actions and organising capacity - it was this that would have been the way forward. - Build up a 'design for the disabled' unit, with the Ministry of Health, to look into things like artificial limb control systems (which could use Lucas's control engineering expertise), sight aids for the blind, developing the 'Hobcart'. This vehicle was designed in the 1970s by an apprentice at Lucas to give mobility to children suffering from Spina Bifida. Lucas management had refused to develop it on the grounds that it was incompatible with their product range. The Plan proposed various other ideas in the areas of braking systems, undersea exploration technology and remote control devices. The thrust of the Lucas Plan was radical from the beginning. It asked basic questions like what was the real use of Sting Ray missiles and high technology fighter aeroplanes to society. Their production gobbled up money resources and technical inventiveness, making those who owned the Companies richer and richer but society got nothing from them. Basic needs in society are only filled inadequately, like for instance kidney dialysis machines, whose general shortage in society was then and still is a crying shame. Lucas, its workers argued, had the expertise to develop better, smaller and more mobile units which kidney sufferers were crying out for. Why shouldn't they do so? Worse still, under a system that produces high quantities of weapons and armaments, not only is money wasted but also much human technology and innovation is wasted or misused as well. Take the proposal by the Lucas workers that the sophisticated radar systems used in modern fighter planes be used in the development of an "alternative sight" aid for blind people. Such a thing is easily within human capabilities, but is not made or even developed as a priority now. Under capitalism the world's resources and wealth is owned and used to make profit for the wealthy. Most money is invested where profit is highest. The fulfilment of human needs is always a secondary priority The Lucas Plan challenged many of the basic assumptions of capitalism: why should profits come before people? What value have military goods in a world with so many other pressing needs? As such it was important. But far more fundamentally it showed what capacity workers have to articulate their priorities and their values. For the future it showed what enormous potential a society based on socialism could have. Such a society with real workplace democracy and the participation of all in the management of society would allow for the creative capacity of each individual to have its say while the real needs of society are met. But for this to be achieved as the Lucas workers learned, capitalism and its priorities must be overthrown. Having worked at Lucas from 1959 to 1990, I find the article very interesting, but heavily glossed. What we have is the position in outline as far as the Lucas Combine is concerned ,but it scarcely reflects the situation on the shop floor. In the area where I worked there were about eight unions who were dominated by the AUE, as it was around then. Again in numbers, the shop stewards were heavily weighted by the AEU, who worked hard to get new employees in to their union. But, the ,'Engineers," were dominated by the skilled men, who in many ways were the tyrants of the shop floor and ignored the demands or requests of the women for equality or the lower paid in general. When we consider that the voting was by union and we had Tinsmiths and Electricians, plumbers, the unslilled were out voted, indeed they barely surfaced. The annual wage claim for years was across the board , which meant that the unskilled were losing ground yearly, yet the pretence was that it was an equal claim. It was only when a TGWU, shop steward pointed out that 6% of £100.00 was scarecly the same as 6% of £200 or 300 ? The comrade was met with an attempt by the AUE, branch chairman, a left winger on the district committee, to stop him talking to the workforce! Later, the Drivers, (T&GWU,) came with a plea for parity with the skilled sections. This was opposed by the Senior Shop Stewards Ctte, who actually banned the T&GWU delegate from the S.SS.C., when a stich up was agreed to by the Lucas management. Not that he had broken any rules, but that he had offended the skilled men by gaining parity! This left the T&G. without any representation on the S,S.Ctt. It was only when the Sec, of the Lucas T&G announced that he, a shop steward, would take the seat, (according to the rules,) at the next meeting that a rep, was allowed back, not the Sec, who though he was a steward of some years experience, was also an Anarchist but a non political steward. In the sixties or seventies agreement was reached between the SSC and management for a bonus! It was to be paid through the wage, but not to the canteen women, or the safety / firemen. Why? They didn't produce! On the factory floor very few people produce, most make production flow smoothly,i.e. Semi-skilled inspectors, labourers, drivers and so on, but without them production becomes hard and slows down. Why were the firemen and the ,canteen women,'discriminated against? When the T&G, delegates asked why, much later, we were told, they don't produce anything and it's a production bonus! and certainly for ten or so years the subject was never discussed at shop stewards general meetings, until in the eighties a new figure arrived on the scene,a chef, or,' a new canteen worker.' She made a difference, tall ginger haired, slim like a flower, one of the inspection Shop stewards described her. She was no fool and immediately honed in on the very obvious anomaly, no bonus! She brought it up at the T&G shop stewards meeting and received support. The agreement was to put it to the SS Committe for discussion. There was no change, before it could be put to the vote we had to get it on the agenda and that event was always put off, usually it wasn't the right time, or it would cause a dispute amongst the shop floor. Eventually, after intense lobbying it obtained a place , there was more lobbying for support and the lady chef, totted up and we had on paper half the votes needed for success. It failed miserably much to the shock of the Chef! The fact was the bonus was a percentage on profits and paid out to the shop floor weekly. As one skilled inspector said, if we pay them, there's less for us! Much is said even now about the change from armaments to necessary usage, as one leaflet had it! Yet the scheme was never positively explained , there were no discussion or real education on the matter! There might have been a few enthusiasts up and down the combine but interest generally was never encouraged by union head office or local combine officials, these were usually AUE and more interested in gaining branch members to boost their own remuneration! Hey, thanks for posting that, that's really interesting. If you ever felt like writing anything else about your experiences from that time we would be very interested! Interesting comment. As I've know the author of the article a long time, I'm gonna pass the link along to him. I very vaguely remember that one of the criticisms of the Lucas Combine was, by the time the Combine was organized, that the whole nature of shop-stewards had changed. That they became the body for and of discussion, not mass meetings or ways in which shop-floor stewards acted in the past. But this is just a vague recollection. If anyone remembers my granddad, Ben Chadwick, from that era I would be keen to hear from you. I know he played a part in the unions in Burnley for many years around the 70s and I often heard companies like Lucas, Mullards, Phillips mentioned.